Is Chris Christie Really That Desperate to be Veep? From Fort Worth Star – Telegram/Getty Images. Just when I thought I was getting a grip on the Republican Party presidential candidate selection circus they added another ring. Former GOP hopeful, New Jersey Governor Chris Christie, has endorsed front runner Donald Trump. 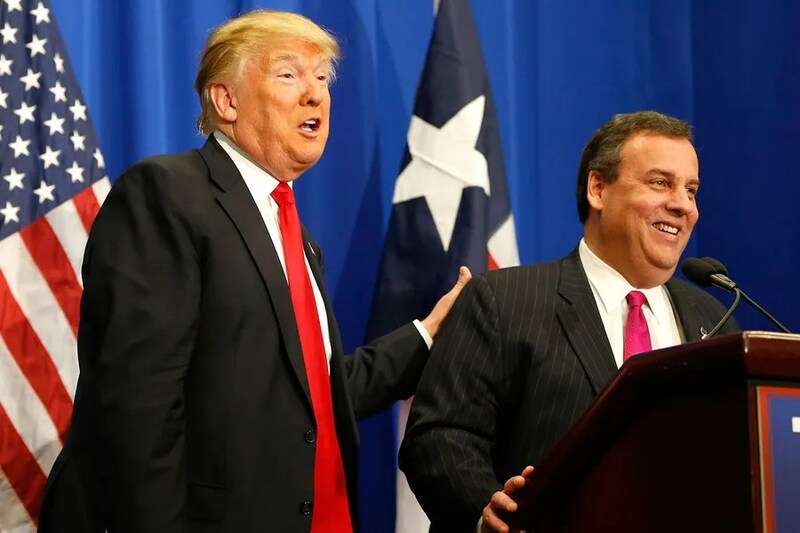 I suspect in return for his kind words, Christie has wangled a Vice Presidential role should Trump win. I first noticed Chris Christie during television coverage of Hurricane Sandy when he cozied up to President Barack Obama while seeking federal assistance for the devastated New Jersey coast. He came across as a genuine, down to earth guy who was concerned for his constituents well being and rose above petty party politics. He was criticized by fellow Republicans for being too palsy with the president, but claimed he was just looking after his people. (Palin) was all over cable news channels for a day or two, screeching on and on about Trump, sending chills – think fingernails on a blackboard – up the spines of anyone with an appreciation of the English language. I admired him for his approach, evidently putting partisan politics aside at a time of disaster. Then some of his luster was tarnished when he annoyed motorists and endangered lives by having aides arrange sham construction work that caused five days of traffic standstills on the George Washington bridge to Manhattan. It is assumed he was attempting to punish Fort Lee’s Democrat mayor, Mark Sokolich, who had opted not to endorse Christie’s re-election bid. It was a very tacky, dangerous and unpresidential tactic. One of Trump’s first ‘star’ endorsements was former Alaskan governor Sarah Palin. She was all over cable news channels for a day or two, screeching on and on about Trump, sending chills – think fingernails on a blackboard – up the spines of anyone with an appreciation of the English language. But lately she has disappeared, no doubt with a sizable cheque in hand. I think Trump made it clear that no ‘running mate’ clause was included in their agreement. On the other hand Christie has hitched himself to the Trump wagon, he has gone all in. For a man who has political aspirations that exceed his governorship, he has shot himself in the foot. If he thinks his presence on a ticket with Trump will lend credibility to their White House run I think he vastly underestimates the American electorate, not to mention Trump’s penchant for asininity. Once out of the friendly confines of the GOP, I think a rude awakening awaits Trump and those associated with him. Trump is currently the cat’s pajamas with the Republican rank and file, if not with the establishment. But should he, as it looks now, win the party’s nomination, he will have to convince voters of all stripes that he is the best choice. Enter Christie, a seasoned politician with proven skills. Will he balance out Trump’s bombastic character? Can he sell the idea that a Trump and Christie ticket features both moxy and administrative acumen? I think not. Rather, I believe governor Christie has made a huge mistake with his endorsement of Trump. Once out of the friendly confines of the GOP, I think a rude awakening awaits Trump and those associated with him. While I would love to see Bernie Sanders win the Democratic nomination, I am not gullible enough to think there are sufficient voters within the party to elect a man who admits to being a socialist. So we are looking at Trump vs Hillary for the Oval Office. In one of life’s odd moments I find myself in complete agreement with the establishment of the Republican Party; I think Hillary will chew up Donald Trump and spit him out. Does Governor Christie really want to be part of that? Among the numerous comic portrayals of the pair, reference to the sophomoric movie Dumb and Dumber is very popular. I hope it does not come back to haunt Governor Christie. It would be impossible to get a grip on this. It is made of slime and yucky slippery gunk. Like the candidates. Slime and sleaze and yucky stuff.